They made their fans wait, but Kettering Town are now deserved champions. 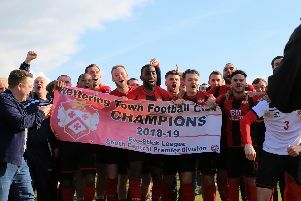 There can be few arguments, Kettering Town are deserved champions. The Poppies had worked themselves into a position where it became only a matter of time before the inevitable was confirmed. I am sure everyone would have preferred it if they had got the job done at home to Alvechurch the previous week but they finally got over the line with a solid, if unspectacular display at Halesowen. Overall, it has been a fairly dominant campaign from Marcus Law’s team with the tone being set by six wins in a row at the start of the season. They stepped things up a gear in January and February and since then, despite the odd bump in the road, it became something of a procession from that point onwards. People can, and will, talk about budgets and Kettering won’t lie to you, they threw plenty at this promotion challenge this season. But it’s one thing putting the tools in place, it’s another thing to execute the plan. And, in the end, Marcus Law and his players did it almost to perfection. A job very well done. Spare a thought for Halesowen, the class they showed despite being relegated should be a lesson to everyone. For every team that gets promoted, there will always be one that is heading the other way. And while the Poppies savoured their moment, it was hard not to have some sympathy for Halesowen Town as they were relegated as a result of this defeat. I think it’s fair to say it had been coming for a few weeks and hopefully they will bounce back soon. There was a warm welcome for everyone of a Kettering persuasion, the day was organised exceptionally well and the Poppies fans respected the request of the home club to stay off the pitch until the Halesowen players and the officials had headed to the dressing-rooms. Halesowen are a good, solid non-League club with one of those superb old school grounds that every single Kettering fan wished their club still had. They showed class when they didn’t have to and that’s something everyone can learn from. The travelling support and the turnout the previous week shows the potential of the Poppies. Kettering have been through some hard times in the not-too-distant past. Indeed, they’ve probably been to rock bottom and have had to find their route back. But, even in the darkest of times, you knew there was a fanbase in place that simply needed to be inspired again. People behind the scenes have worked hard to build it back up but, ultimately, it’s always results on the pitch that will bring folk through the gates. As they have approached the finish line, we saw a crowd of over 1,500 at Latimer Park last weekend and then something close to 800 fans made the trip up to Halesowen to see them finish the job. The Poppies will be heading into a tough league full of big clubs next season. And they will need that support behind them - win, lose or draw. Just like he has done for the majority of the season, Rhys Hoenes made the difference. As ever, winning a title is always a collective effort. But every team needs a star performer and Rhys Hoenes has taken that role and run (extremely fast) with it for the Poppies this season. He set his own tone by getting them up and running with the only goal of the game in the 1-0 win at Hitchin Town on the first day of the campaign way back in August and has never really looked back since. He’s led the line by himself, he’s played out wide, he’s played as part of a front two and a front three but, in general, his performances have been consistently good. So it was quite fitting that he should score the goal that sealed the deal, even more fitting was the fact it was his 20th of the season in all competitions. An impressive effort. Now it’s time to enjoy the moment while knowing and respecting what lies ahead. The Poppies have done it with three games to spare. Winning a title isn’t something that happens very often but the Kettering fans, even if they won’t admit it themselves, have been somewhat spoilt on that front with this being the fourth title their club have won since the turn of the Millennium. But they’ve had their fair share of dark times as well, which makes it all-the-more important that everyone savours the moment for the last couple of weeks of the season. With the Vanarama National League North (we assume) awaiting, there will be a lot of work to do both on and off the pitch to ensure the Poppies are competitive in what will be an extremely tough division. But, for the time being at least, the staff, players and fans should and will take it all in.